“Ekta Parishad Jindabad,” (Long live Ekta Parishad) somebody shouted at a corner. “Ekta Parishad Jindabad,” a chorus followed. At a glance, people who were chanting the slogans looked feeble and powerless. Many didn’t have sleepers, showing cracks on their feet. Wrinkled on their faces told the story of hardships and struggles. When they chanted the slogans, their fist clenched, a sudden determination emerged on their faces. “Land, water, and forest must be under people’s control” another slogan emerged. They were the people of Ekta Parishad. A Gandhian social movement active in India. 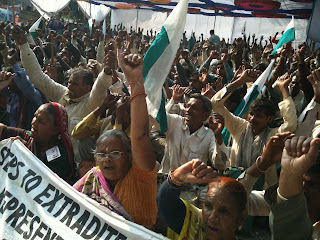 Championing the rights of marginalized communities (Dalits and indegeneous communities) in India for their land rights. Similar to Sarvodaya Movement in Sri Lanka, Ekta Parishad is a social movement and a federation of 11,000 communities spread over 12 Indian states. Like the Sarvodaya Movement, rooted in Gandhian values, Ekta Parishad is dedicated to non-violent social change. Their programs are geared towards building gram-swaraj (village self-governance) and local self-reliance.